I’ve spent a lot of time recently writing about how I use Hypothesis in my own research and writing, and also in my classes with students. In various blog posts here on this website, and also videos on my YouTube channel, I’ve detailed how and why I use this as an assessment, and tool to guide students in their reading and discussions. In this post I want to provide some granular advice on how I frame the use of Hypothesis for students, and some of the rubrics I use in this process. Please keep in mind that this is a moving target. That is to say that I have been changing my expectations for Hypothesis as they relate to student discussion and assessment. As I continue to use the tool and platform, I believe my thinking and rationale will continue to change. The way I view Hypothesis is that you’re keeping a trail of breadcrumbs as you read online. Many of us will bookmark a website in our browser as we read. This creates a stockpile of bookmarked sites to refer back to (that we never do). Still others save webpages we want to read in a “read it later” tool (Pocket, Instapaper). This basically saves the webpage in a stripped down format for reading on a device. The bookmarks solution doesn’t work (for me) because we rarely go back to review this information. The “read it later” services are nice because you’re actually reading things at a deeper level…but you’re basically remembering elements of the entire page, not individual points. This can be a challenge for content that is very nuanced. An annotation service like Hypothesis allows you to highlight, save, and (possibly) share individual lines from a text. This allows for saving this content across a page, and across multiple pages for themes. Used in discussion, this allows for collaborative reading exercises, or group annotations. This also allows for conducting research while you write and annotate. Since Hypothesis will import PDFs, you can annotate in the tool, it will give you a digital trail of breadcrumbs as you’re reading online to see what you found to be important. After you are finished reading and researching, you can go back and see what texts you’ve read, and the important elements from these pieces. Furthermore, if you effectively tag your annotations, you can look for larger themes across your readings. I primarily teach classes in literacy and technology to pre-service teachers. My classes generally include weekly readings that span a variety of forms of “text” as I want my students to think more broadly about text and how they consume information. This means that I share blog posts (many times my own posts), websites, research PDFs, audio podcasts, and YouTube videos (many times my own videos). It is important to note that my classes are always hybrid or blended. That means that I see them face-to-face for 1 to 3 hours per week. The remainder of their work is online. They are expected to read and discuss online, and come in to class prepared to collaborate and do some hands on work. This may include reviewing my recording of the class lecture on YouTube, and coming in to class prepared for an activity motivated by that lecture. Put simply, the thinking and learning is expected to never stop. It is a process that should follow them as they proceed throughout their day, and allow them to think more deeply about the content. Hypothesis plays an important role in this process. I use Hypothesis as my “discussion forum” for almost all of my classes. Previously, I would use Google+ Communities or threaded discussions to hold online components of our class interactions. In this, I would post a prompt, or have a student post a prompt, and have each member of the class present two or three points before, or just after the class. Hypothesis allows me to have students have discussion about the text, baked in to the text. This means that instead of presenting them with a reading or two and a prompt, they can highlight individual lines or sections about the text, and respond/reply to each other. This also gives students a nice thread of annotations and discussions they have had over the semester to use in studying or other assessments. Finally, Hypothesis provides the added benefit (to me) of allowing students to see the work of others. If you’re a striving reader, or feel like the text is too dense, you can lurk a bit, and see what your peers find to be important about the readings and jump in when you’re comfortable. Please also note that much of my thinking about this first relies on the learning objectives or task. I’m looking to modify, or redefine the learning activity, and the specific tools do not matter as much. In searching for a more authentic tool to use for online student discussions, Hypothesis fits a specific need for me. 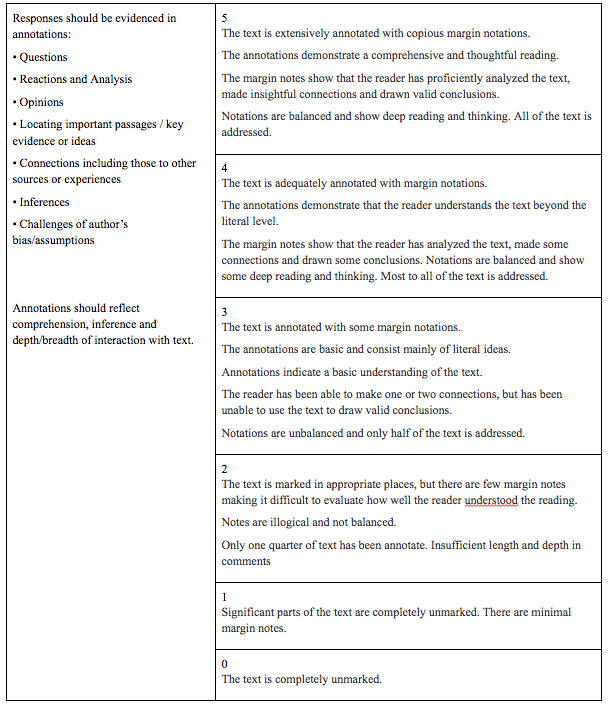 In the use of this tool, I’ve also had to modify my discussions prompts, and other assessments in the class. In the remainder of this post, I’ll describe two different uses of Hypothesis, and how I assess each assessment. This is a supplement to this video overview. In one of my classes, I use Hypothesis primarily as a tool to hold online discussions focused around one text per week. The class, Development of Language and Literacy (syllabus here), is one of the first classes our students take as they enter the program. The class is four-legged stool in which we focus on theory and perspectives, phonics instruction, culture and identity, and cognitive development. Each week, students are given a PDF to read and annotate. I send them this PDF through our Google Classroom. I also create a private group in Hypothesis and expect that they read, annotate, and discuss on the PDF with their peers over the week. They are expected to minimally provide three annotations per week. This includes one of their original thoughts, and one reply to a note from a colleague. The rubric for this activity includes a five point scale that focuses on comprehension, as well as developing inferences as the student interacts with the text and peers. In this class, I previously quizzed students two or three times during the semester to see what they learned/remembered from the readings. I have since removed that assessment and focused solely on these interactions in Hypothesis. I also had students present (twice a semester) a Google Doc in which they indicate what they’ve learned, and larger themes from the readings. In this, they would include links to go directly to their notes in Hypothesis. I may go back to this model in future classes. The model above works well, yet I will continue to tweak it. I think a five point rubric is a bit too much for this activity. I think a three-point rubric that focuses on the CRAVES metric shared by Greg McVerry might be a better fit. The second way I use Hypothesis as a class assessment is completely different from the earlier version. In my technology classes, I have students annotate openly online in Hypothesis, and expect that they search broadly as they search, sift, and synthesize. As example of this is my recent class, Using Instructional Technology & Project Based Learning (syllabus here). This class is a four-legged stool in which we focus on integration of educational technologies, project based learning, digital and web literacies, and digital identity construction. Students actively build up a domain of their own throughout the course as they build up a WordPress website to serve as their digital portfolio. All of their work in the class is saved in Google Docs and reviewed/revised by peers before finally moving it to posts on their website. The course is centered around four modules that each take two weeks to complete. In each module, students are provided with sections titled READ, WATCH, DISCUSS, DO. The READ and WATCH sections each include five texts (five websites/blog posts/PDFs and five YouTube videos). Students are directed to review all, one, or none of these texts. That is, they are provided with a selection of texts across a couple of themes. They are to consider the focus of the class lectures, and the activities of that module, and consider how these texts inform those materials. They are select readings that help them fully understand this content, and keep searching online to answer any questions they may have after reading the texts that I have provided. Once again, they can read all or none of the materials that I provide, but they are to search and sift online and continue their exploration. They should use Hypothesis to track their learning over time. They should also understand when they fully understand a topic, and conclude their exploration. These are skills necessary in online reading comprehension, and I’m instilling them into our assessment (hopefully) in an authentic manner. There are several ways that I assess learning in this activity. First of all, I have students tag everything with a hashtag for our class. I pay attention to this hashtag on Hypothesis, and see who is posting, and who is not. I also dip in now and then to monitor students that do not seem to be regularly getting involved. More importantly, I want to see evidence of this work used in their weekly blog posts in which they reflect and synthesize what they’ve learned over time. These blog posts originate in Google Docs and are reviewed/edited by peers. They are then copy/pasted over to their website as a blog post. The understanding that this work will be accessible by others online, but most of all by their peers…is usually a good motivator. 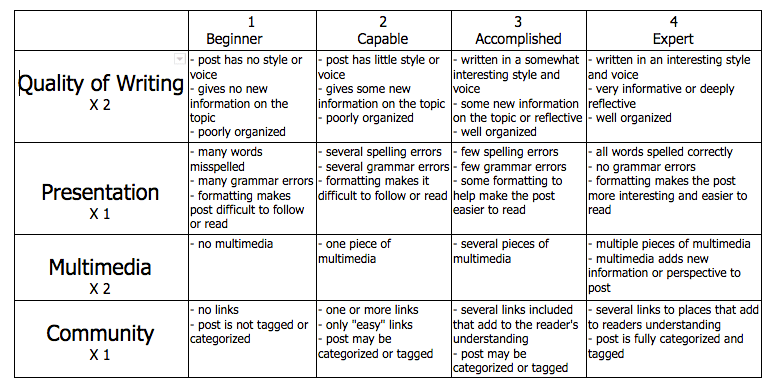 To assess each post, we either use a modified version of the CRAVES rubric detailed above, or the rubric embedded below. In each section of this class, I provide the CRAVES metric, and the rubric below on a Google Doc. We discuss the values and weights of each descriptor on the rubric and allow the class to review and revise the rubric for one week at the start of the semester. After that time period, the agreed upon rubric is used for assessment in the course. As detailed above, I’ve been actively testing out different models for my uses of Hypothesis. As a reminder, the focus should be on learning objectives and the task…not on how to integrate a new tool. As I’ve strived to have more authentic readings and discussions in hybrid, or blended learning spaces, Hypothesis has presented an opportunity to have discussion about the text, baked into the text. What I’m seeing is more informed discussion, focused on elements of the text, as opposed to wide-reaching discussion threads that seldom move past students generally agreeing with the author and each other. If this post helps you scaffold discussion, you should subscribe to my weekly newsletter. I help make you the expert by framing the important stuff from the week in technology, education, and literacy.